Financial advisors must assess how much risk clients can take. The standard way to do this is a questionnaire asking how you'd feel if you lost money in the market. But people are terrible at judging their future emotions. When stocks are booming, they'll tell you they love risk and can handle volatility. When volatility comes, they curl up in the fetal position, change their minds, and become conservative investors. Even if you don't use a financial advisor, you probably have some sense of what your risk tolerance is. And it's probably wrong. There's too much evidence showing that people guessing how they'll feel in the future are really just explaining how they feel today. The best measure of actual risk tolerance is past behavior. If you panicked and sold during the last crash, you'll likely do it in the next one, regardless of how you feel today. Risk itself is a dangerous word. Ask 10 smart investors what risk is, and they'll likely offer the same answer: Risk is annual volatility, or when stocks go up and down. But ask those 10 investors what their goals are, how long they have until retirement, what schools their kids want to go to, or how much debt they have, and you'll get 10 different answers. Risk is the odds that you won't be able to do something you want to do. And since everyone wants to do different things, what's risky for one person is irrelevant to another. Pundits talk a lot about whether the market is too risky. But too risky for whom? For me? For you? A 90-year-old widow? A day trader? A pension fund? We all have different objectives, and shouldn't pretend we have the same risks. Financial planning is great because it gets people thinking about the future. But it's dangerous because it fools you into thinking you know what the future will look like. Life neither knows, nor cares, about your plans. It's going to do whatever it wants, and there's nothing you can do about it. In the last five years, an average of 1.7 million people have been laid off every month, 3.6 million Americans had heart attacks, a hurricane almost took out Long Island, and it stopped raining in California. Oh, but you had a plan! Rather than a plan attached to a specific date, people are better off using systems, or things you can do every day, to increase your odds of happiness in the long run. Uncertainty has been an excuse not to invest for the last five years. There's uncertainty about tax rates, uncertainty about health-care costs, uncertainty about regulation, etc. If you don't know what the future holds, they say, you can't make smart investments. I think uncertainty is one of the most dangerous words in finance. The future is always uncertain. We never know what future tax rates will be, or what future health-care costs will be, or what future regulations will be. What changes is people's perception of uncertainty, which is a reflection of their complacency or fear. A group of economists from Stanford and University of Chicago made an index that tracks uncertainty based on newspaper references, regulatory changes, and political shifts. 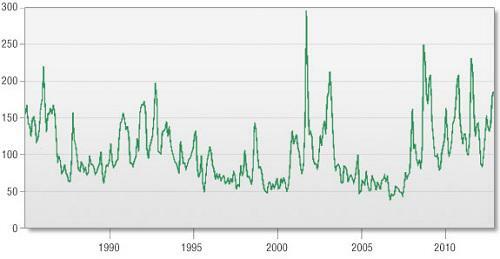 Their index shows that uncertainty bottomed -- and hence certainty about the future peaked -- just before 9/11, and in 2007, just before the financial crisis. People feel the most certain about the future right before things change. Doesn't exist... for two reasons. One, any analysis about the future relies on assumptions, and all assumptions are a product of someone's biases -- optimism, pessimism, political beliefs, past experiences, etc. If you're not alive enough to be biased, you're too dead to be doing analysis. Two, there's a general belief that the analysis with the most numbers, charts, tables, graphs, and Excel tabs is the most objective -- look, math! But lots of numbers and charts can increase confidence faster than ability. A group of MIT students once generated fake scientific papers, literally just stitching together random science buzzwords. More than 100 of the papers were published in science journals. I'm willing to bet you could do the same with a Wall Street research report. People underestimate their ability to be fooled by things that look smart, but are utter nonsense.